Our escape games create laughter, fun, and a wholly unique experience while promoting creative thinking and collaboration. In one exhilarating hour, team dynamics are challenged and individual strengths heightened. Team members work together towards a common goal. We've hosted hundreds of teams in the Raleigh-Durham region, including groups of educators, engineers, lawyers, bankers, students, administrators, marketers, medical personnel, etc. How will your team perform when the clock is ticking and the pressure is on? Read more about the benefits of escape games for corporate team building. Perfect for companies, student organizations, teams, youth groups, and more! Special events can be booked anytime, Monday through Friday. To learn more and to book a special event, email info@bullcityescape.com. "I scheduled two private rooms for a team building experience for work. No surprise to me that EVERYONE loved it! We had such a blast and it was such a good bonding and learning experience. I highly recommend it to anyone looking to have a fun time. It was my first Escape Room experience and I was SO impressed by the level of complexity of the puzzles. It's even cooler to know that the owner develops these puzzles on her own! So cool! Don't think twice - go!" 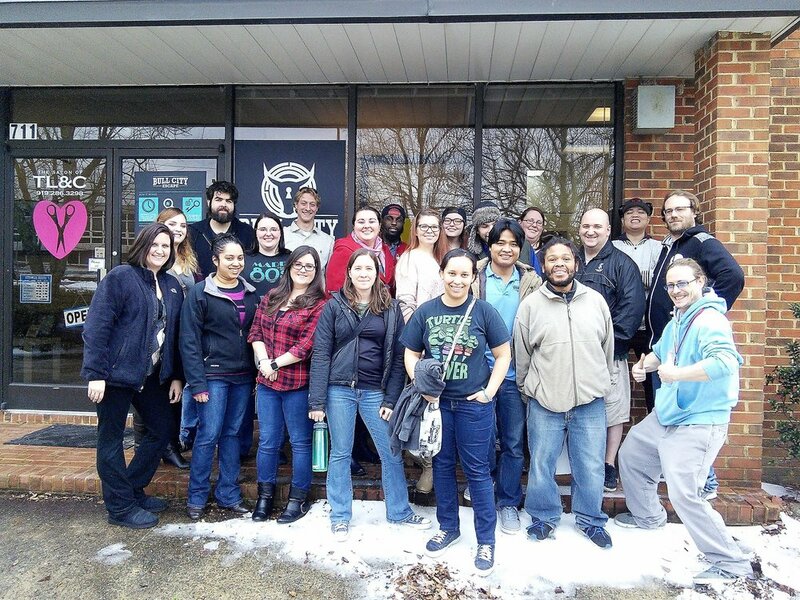 "Phenomenal experience... Out of our group of 20, only two had ever done an Escape Room before - and the three Game Masters did a great job making our group feel welcome. Of the four Escape Room locations I have been to in the Raleigh/Durham area, this is by far the best in terms of the quality of the rooms. The game play was great, the rooms were professionally decorated, and we had a blast. I would highly recommend this place for corporate events and team building exercises. Our group could not stop talking about the event on the way back to the office, and more than a few people expressed interest in going back and doing the other rooms. 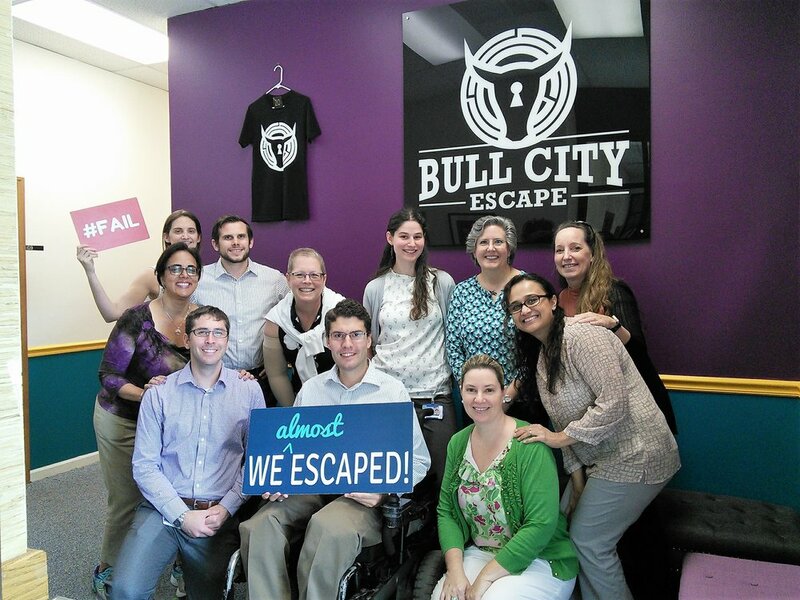 Well done Bull City Escape!" 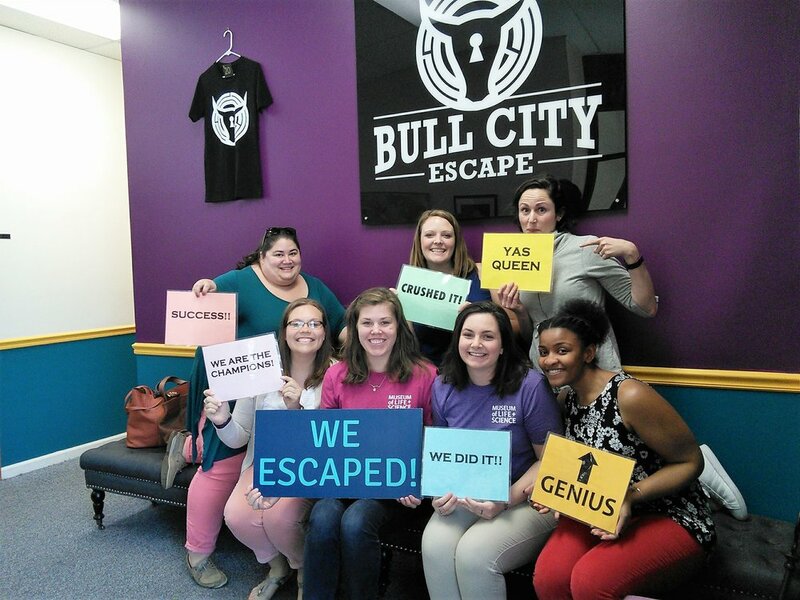 "I had so much fun at Bull City Escape. I went with a team of five of my coworkers, and it was fascinating to see how we all worked together... Our team’s dynamics mirrored those that we have at work, but the new setting and pressure pushed us to communicate and collaborate in new ways. It made me appreciate the varied strengths, senses of humor, and ways of thinking of my coworkers even more than before - we needed everyone to get it done!" 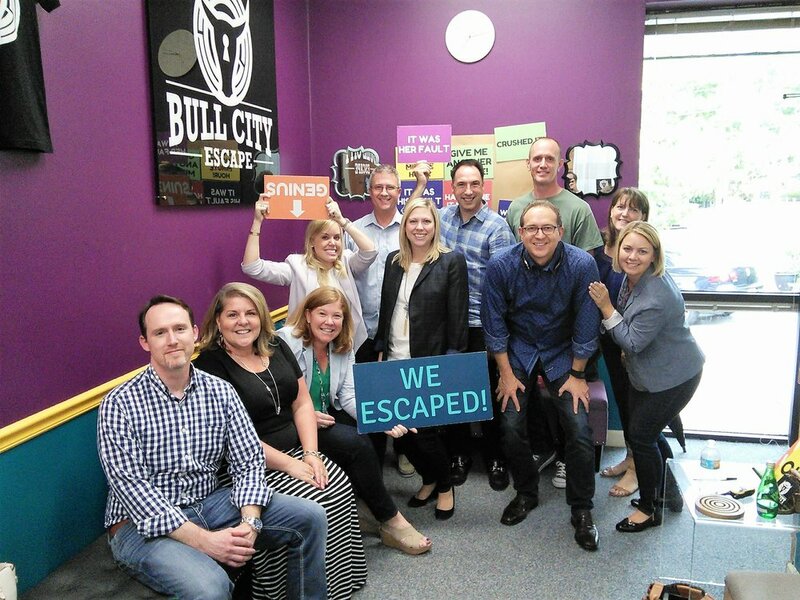 "A member of our ministry team was stepping down to return to the pews and we went to Bull City Escape to celebrate her. It's a very fun experience! We were very impressed with the atmosphere, challenge of the puzzles, and welcoming spirit of our host! It's also an experience that rewards you for working together and having a mix of talents and personalities in your midst. Highly recommend!" "This was a great experience for our group of colleagues! Some of us knew each other; some didn’t. At the end of the game, we knew each other better—and we had a ton of fun as an added bonus!" 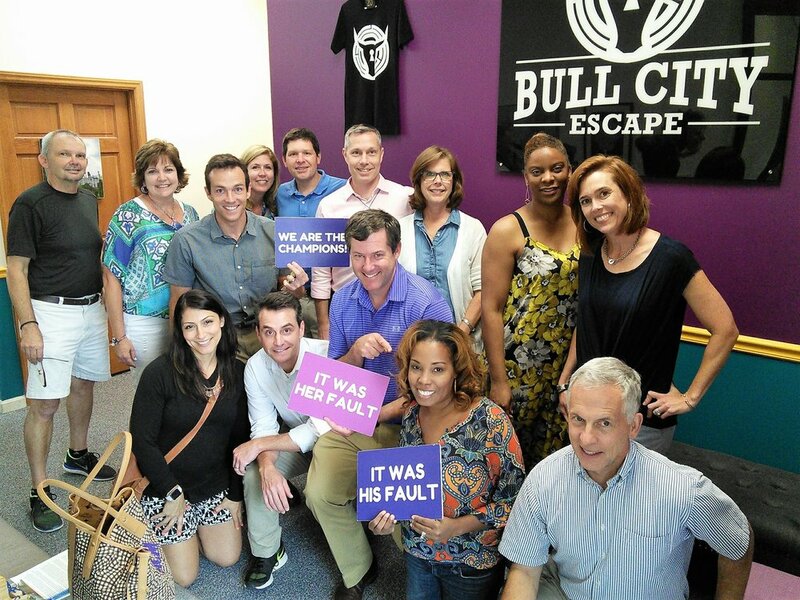 "Our company decided to try out Bull City Escape for our company outing and had a complete blast! We were split into three teams and each team was assigned to one of the rooms. We couldn’t stop talking about the different experiences each of the teams shared all through lunch. The staff is wonderful, the clues are interesting, and it really gives a chance for team building or just plain fun." "My company scheduled a private event as a team-building exercise. This was by far the most fun, and most challenging, team-building activity that we could have hoped for! 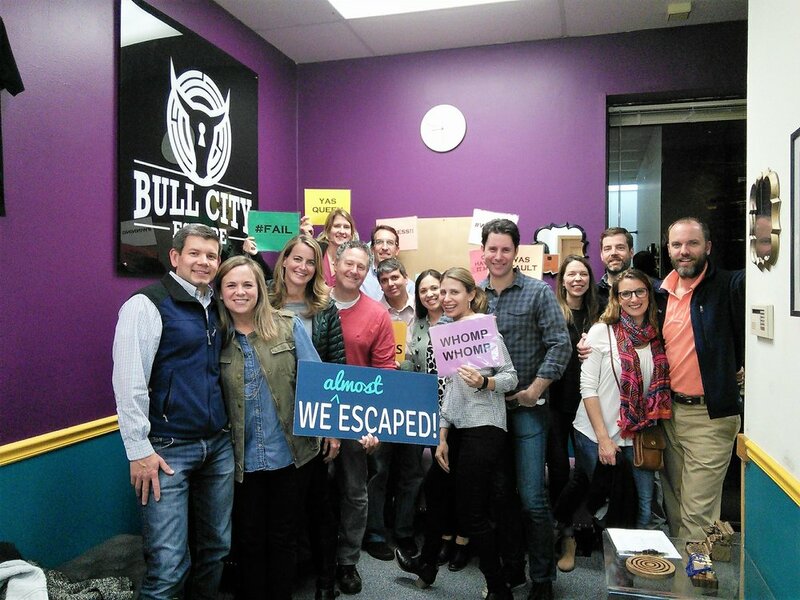 I highly recommend Bull City Escape to other small and big companies looking for valuable team-building activities."